BevExpo2016 started with ambitious plans to bring back a UK based industry exhibition and seminar programme for the brewing supply chain. Having not been done for years, the client (incorporating Cellar to Seller and BrewEx) approached Apex to find out if we could make it happen for them. Held at Manchester Central, an Award winning Convention Centre in the heart of one of Europe’s most dynamic and exciting cities, the two-day event was a tremendous success. Seminar zones, embraced within the exhibition stand area, facilitated presentations on products, equipment, and services throughout the chain. And, with networking key to the success of the event, the wider beverage industry met, learned, and discovered more about the excellence of products and services that make up the entire beverage industry supply chain. From the off, the client explained that there was a lot of work required to make this happen. We had to find a venue, design a brand and logo, design and develop a website, manage all the exhibitor bookings, handle the cash and card payments, organise the seminar rooms, liaise with speakers, open an online booking page for attendees, project manage everything and staff the whole thing over two days. And we had to deliver all this while making sure the budgets worked for our client. Luckily, with 25 years’ event management experience, this is exactly what we do. So we rolled up our sleeves and got to work. And, with over 80 UK and international exhibitors and seminar presenters, this two-day super-sized trade event brought all sectors of the beverage industry together. Feedback from exhibitors, sponsors, and visitors has been hugely positive, with social media abuzz with updates and photographs of the event. 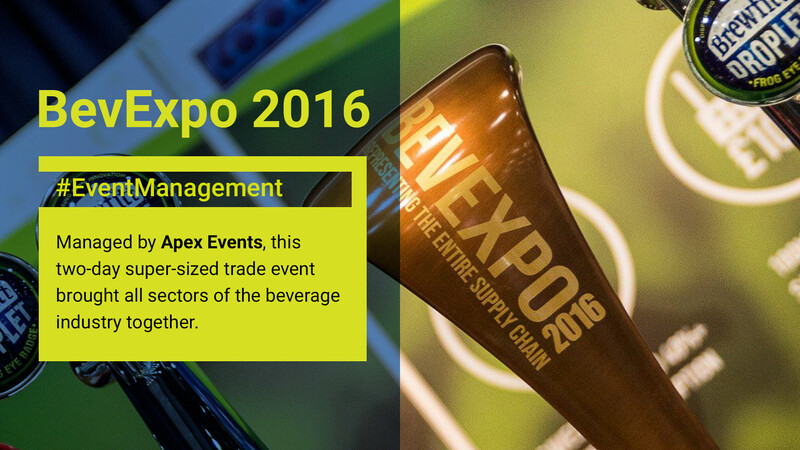 Follow @BevExpo and @Apex_co_uk on Twitter to keep up with developments as they happen. Check out our other case studies below. Or contact us to find out how we can help make your events a success.